The Hindu Mahasabha has decided to commemorate the death anniversary of Nathuram Godse, Mahatma Gandhi’s assassin, as martyrdom day at district level in all states on November 15. 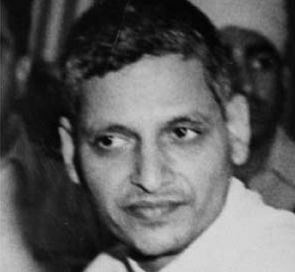 As a part of the commemoration, the right-wing outfit also plans to hold blood donation camps and distribute literature written by Gopal Godse, the younger brother of Godse and a co-accused in Gandhi’s assassination, to the public to take the debate to the grassroots on whether Godse was a “patriot or a traitor”. “We have decided to commemorate November 15, the day Nathuram Godse was hanged, as ‘Balidaan Diwas’ at the district level in each state. We will also hold blood donation camps on the day,” All-India Hindu Mahasabha president Chandra Prakash Kaushik said. He added that the collected blood at each camp would be handed over to the government hospitals for use of soldiers across the country. “Copies of literature written by Gopal Godse would be distributed to people, including his book ‘Gandhivadh aur main’ to help them decide. India is a democracy and let the public decide whether Godse was right and was a ‘patriot or a traitor’. Whether Gandhi is truly the nation’s father or not, the people should decide,” he said. The Sabha also intends to enact plays highlighting events in Godse’s life and present the speeches given by him during his trial to “bring out historical facts” before the public. Godse killed Gandhi at Delhi’s Birla Mandir on January 30, 1948 and was sentenced to death on November 8, 1949 after a trial. Godse was hanged in Ambala jail on November 15, 1949. Kaushik alleged that successive Congress governments in the past have “tainted” Godse as a “traitor” and we want to highlight the truth as he did not kill Gandhi for personal gains but for the nation’s interest.